Q Why do the Japanese all wear black to funerals and weddings? A Whether in the East or West, black brings out a mood of solemnness and austerity. At funerals, a ceremony enveloped in sorrow, wearing black or nearly black is considered most appropriate. Black represents ill-omen and bereaving family members traditionally wore black. Now, black is worn not only by the bereaving family members but also by people who come to pay their respects. 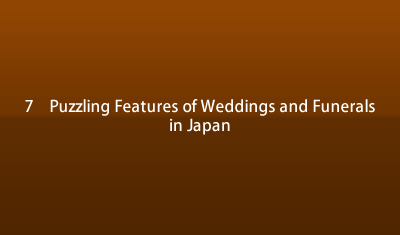 Wearing black at weddings in Japan may strike non-Japanese as odd. Moreover, while women wear a semi-ceremonial kimono or a stylish dress, men are clad in a black or a dark suit. One of the reasons is that the nobility of high ranking who served in the Imperial Court wore a black traditional court dress. Also, the samurai wore a black kimono on formal occasions.